København, known to the rest of the world as Copenhagen, wonderful Copenhagen, became the capital of Denmark in 1415, but several of its fine old buildings date from the reign of King Christian IV, from the late 16th to the mid-17th century. As well as being a great industrial and seafaring port, Copenhagen is one of Europe's most graceful cities with its copper spires and domes punctuating the skyline above the narrow streets and canals of the old town or poking up out of the greenery of its many parks. Only the foundations remain of the first castle, built by Bishop Absalon in 1167, in the cellars of Christiansborg Palace, seat of the Folketinget, the Danish Parliament, rebuilt for the third time on the same site in 1907–28. Although Copenhagen became Denmark’s capital in the early 15th century, much of its expansion and several of its finest buildings date from the reign of King Christian IV in the 17th century. The city has had its share of sieges and fires, and the majority of the oldest surviving buildings are from after the last great fire of 1795. Bombardment by the English in 1807, during Denmark's alliance with Napoleon, also caused much destruction. rides, beautiful gardens, restaurants, and sophisticated shows. Its opening on May 1 marks the official beginning of summer for the city’s residents. Not far from Tivoli is another famous fun spot, Benneweis Circus which opens around April 1. The Town Hall Square is one of the principal hubs of Copenhagen. Dominated by the turn-of-the-century Town Hall with Jens Olsen's famous World Clock and the Lure Player Monument, which is supposed to play every time a virgin passes, it’s from here that the Str¢get, Copenhagen's pedestrian-only shopping street, begins. Its entire length presents an animated scene in summer, often with street musicians and other performers. At the other end of the Str¢get stands the Royal Theatre. About half-way along Str¢get is the Church of the Holy Ghost, built in 1730, bordering Grabrodretorv, a lively meeting place for young people. 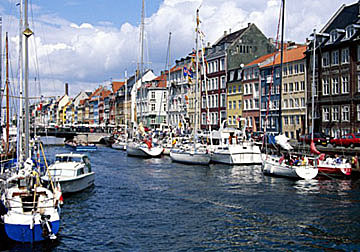 The picturesque canal area of Gammel Strand lies south of Str¢get. Across the canal is the Thorvaldsen Museum, dedicated to the great sculptor, and the massive complex of Christiansborg Palace, with the adjacent Theatre History Museum in the Royal Court Theatre, built in 1766, and the Royal Stables, housing royal vehicles since 1778. Across the canal to the west is the 18th-century Prince's Palace, housing the National Museum. East of Christiansborg. The Renaissance Börsen or Stock Exchange, with the distinctive dragons' tails spire, stands on Christiansborg Castle Square. Across the canal is the Renaissance Holmen's Church. North of Str¢get stands the neo-classical cathedral, built in 1829, the main building of the university, the synagogue, consecrated 1833, and the Round Tower, built in 1642 by King Christian IV. He also built Rosenborg Castle, once the royal country residence. Today, it houses the crown jewels. To the west are the Botanical Gardens and a few blocks east Amalienborg Palace, the royal residence, with its daily Changing of the Guard at Noon. The city’s most famous landmark, the bronze statue of the Little Mermaid, pensively observes the ships that come and go. The city's night life is the liveliest and most varied in Scandinavia, and its winter programs range from shows to the famous Royal Ballet, as well as art and antique auctions.